Well, hello there! It’s been a bit since our last update. We found that we had failed to respond to several requests for information (which are now responded to.) Work has been keeping us busy, leaving us less time for fezzing. But, fear not – we’re back with an update and four new fezzes for the collection! 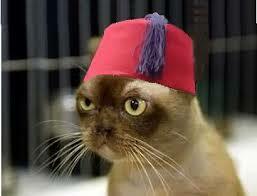 First, swing by the Ancient Mystic Order of Bagmen of Bagdad (sic) area and see a rare members fez, in white and blue. From there, check out updates to the Oriental Order of Humility and Perfection page (a new members fez) as well as the Ancient Mystic Order of Samaritans page (which features a new Past Monarchos fez.) Finally, we bring you a brand new exhibit, featuring the White Shrine of Jerusalem, a Masonic group for men and women. We thank you for your patience with my updates and responses and We hope you keep on fezzing!